WHEN shortly the Quest, the ship in which Sir Ernest Shackleton and his companions are about to set out on their journey of exploration, slips her moorings near London Bridge, she will carry under her bridge a small two-seater seaplane, which it is intended to use for photographic survey work on the antarctic journey. That the seaplane offers great possibilities for this class of work is not to be doubted. It provides a platform from which many miles of country (or sea) can be surveyed, and it is able to cover distances in as many hours as previously took weeks when dog-sledges were the conveyance, especially where the ground is uneven. It may even be supposed that it will be possible for a small light machine to take off, if necessary, from an ice field, providing a sufficiently long, smooth stretch can be found. We are not aware that Sir Ernest intends to use his seaplane for this purpose, but it appears to us that it might be found useful, when the ship approaches ice-floes, for sending out to find, like a sort of modern dove from the ark, open "lanes" through which the ship may proceed, and which could not have been discovered from the relatively low point of vantage provided by the crow's nest! A number of other possibilities suggest themselves, but for anyone not familiar with the actual conditions obtaining in the far south it is next to useless speculating on the possible activities of an aircraft. The primary object of taking a seaplane out there is, we understand, to employ it for photographic survey work, for which purpose the machine - a Baby Avro - is fitted with camera mounts, etc. From the accompanying scale drawings it will be noticed that the Avro has a rotary engine - an 80 h.p. le Rhone, to wit. This should not be taken as an indication that the Green engine is not suitable for the Avro Baby. The wonderful flights made by Hinkler on this combination are sufficient refutation of any such assumption. Under such temperatures as may normally be met with the Baby-Green combination is all that it could be. But in the cold of the extreme south the matter of water-cooling might be one of some difficulty. In order to eliminate this possible source of trouble - and in a case like this it is of little use to trust to luck - an air-cooled engine has been chosen. This would seem to solve the cooling problem, since the correct amount of cooling can presumably be obtained by alterations to the cowling such as can be undertaken on the spot by means of tools and materials carried on board. There would then appear to remain only the questions of carburation and lubrication. As regards the former we do not know whether or not any special precautions have been taken, but the latter has been ensured by placing the oil tank between the two engine plates, to the space between which the hot exhaust gases are admitted, thus keeping the oil in the tank warm and sufficiently thin to flow easily to the pump, even when the outside air is very cold. As regards the machine itself, it is, as will be seen from the accompanying photographs and general arrangement drawings, a more or less standard Avro Baby, with the exception of the fitting of a le Rhone engine in place of the customary Green. Also, of course, the machine is fitted with twin floats in place of the land under-carriage, but this has been done experimentally on the standard Baby. When we say more or less standard, this applies to the general appearance only. One would have recognised the machine as an Avro instantly. But in the detail design there are many alterations, necessitated by the particularly strenuous and exacting conditions under which the machine will be required to operate. For instance, it may be stated that in designing the machine the questions of strength, hard-wearing qualities and ease of erection have been given priority over performance, although the latter is by no means bad, as will be realized when it is pointed out that the engine loading is approximately 19 lbs./h.p. and the speed at sea level 90 m.p.h., while the climb to 5,000 ft. occupies only 15 minutes. Further, the machine gets off remarkably quickly, and handles well on the water, being easy to taxy, even in a strong wind. In view of the fact that the machine may, and probably will, frequently have to manoevre among ice-floes, this is of considerable importance. 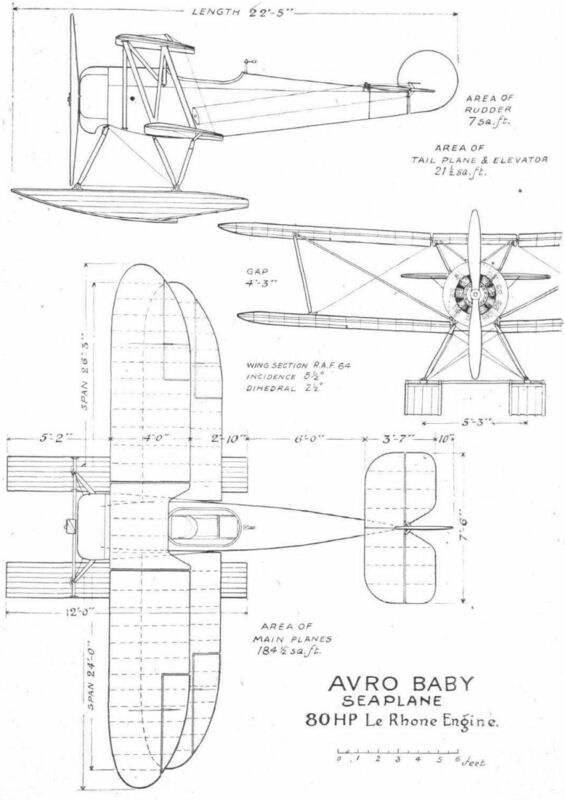 Mention has already been made of the fact that the Avro Baby is intended for use on photographic survey work. In order to facilitate this, the cockpit arrangement has been somewhat differently carried out. In place of the two separate cockpits usually found in two-seaters the two occupants are in one common cockpit, and can thus easily communicate with one another. The pilot occupies the front seat, which is of the aluminium bucket type. The aft seat is without back rest, and is so hinged that it may be swung aft, when the photographer sits facing forward, or it can be swung forward to allow the photographer to face aft while operating the camera mounted above and behind the cockpit coaming. A special cinematograph camera will be used, and also a "still" aerial camera. The machine will be piloted by Major C. R. Carr, D.F.C. who has considerable experience in flying in cold climates such as Northern Russia and the Baltic. Capt. Wilkinson, M.C. who is the naturalist of the expedition, and has taken part in several Polar expeditions, will be the observer and photographer. The Baby has been very thoroughly tested at the Avro aerodrome at Hamble, the final test being a flight of 11 hour's duration, in which the machine was piloted by Major Carr, with Capt. Wilkinson as passenger. During this flight the cinematogrpah camera was carried on board, and a series of pictures taken. Following are the main characteristics of the Avro Baby seaplane: Length, overall, 22 it. 5 ins. ; span, upper plane, 26 ft. 3 ins. ; span, lower plane, 24 ft.; chord, 4 ft.; gap, 4 ft. 3 ins. ; stagger of planes, 1 ft. 6 ins. ; wing area, 184 1/2 sq. ft.; weight, empty, 1,000 lbs. ; weight, loaded, 1,600 lbs. ; wing loading, 8.67 lbs/sq. ft.; power, loading, 18.85 lbs./h.p. ; petrol capacity, 16 gals. ; oil capacity, 4 gals. ; maximum speed, sea level, 90 m.p.h. ; cruising, 70 m.p.h. ; landing, 43 m.p.h. ; climb to 5,000 ft., 15 mins. Altogether the Avro Baby seaplane is a very fine little machine, which reflects great credit on her designer, Mr. Roy Chadwick, and on the constructors, Messrs. A. V. Roe and Co., Ltd. The name of Avro has so long been associated with pioneering that one is pleased to see once again an Avro machine breaking new ground (or should one say ice in this case?). We wish the expedition the very best of luck, and in the months to come our thoughts will often wander down to the southern regions where the little Avro seaplane will be giving the penguins the surprise of their lives. The Avro Baby Seaplane: Side view. The Avro "Baby" seaplane, fitted with an 80 h.p Le Rhone, one which has been supplied to Sir Ernest Shackleton for his Antarctic expedition. With the final tin. 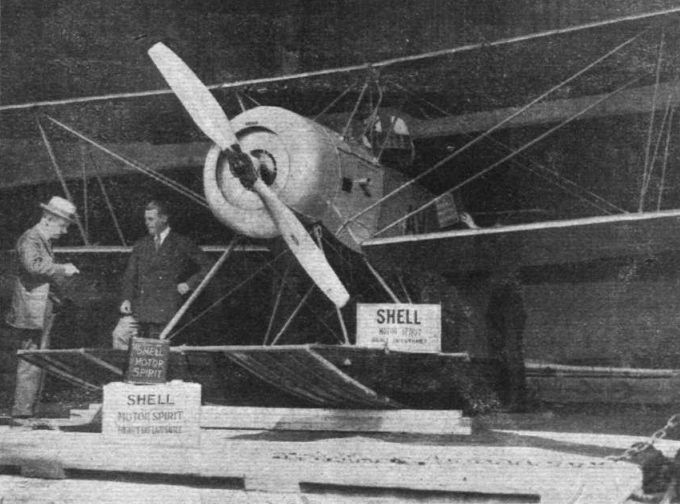 Mr. John Cates saw to it that there should be no lack of "Shell" for the Avro on board the "Quest" against the time of her arrival in the Antarctic, for which she started recently. THE AVRO BABY SEAPLANE: Three-quarter rear view. 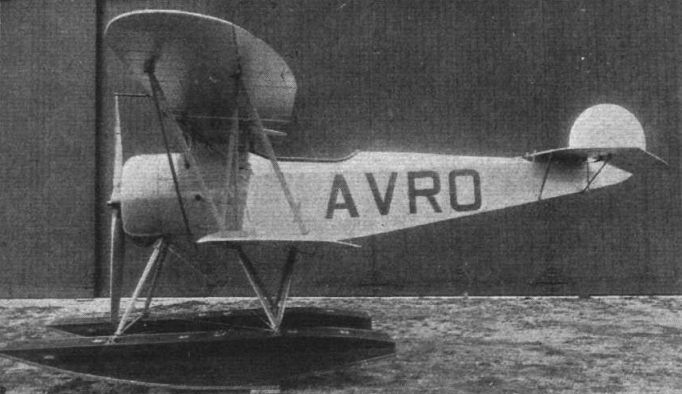 The Avro 80 h.p. Le Rhone Seaplane Two-seater.